Product Design — Copenhagenize Design Co. It's one thing talking about bicycle infrastructure and facility design, but its quite another to design and produce products to further the development of a healthy bicycle culture. Copenhagenize Design Co. has embarked on a journey into industrial design, with ideas and products that match our philosophy of appealing to the mainstream, based on their behaviour and needs. In a city with 40,000 cargo bikes, practical parking solutions are vital. 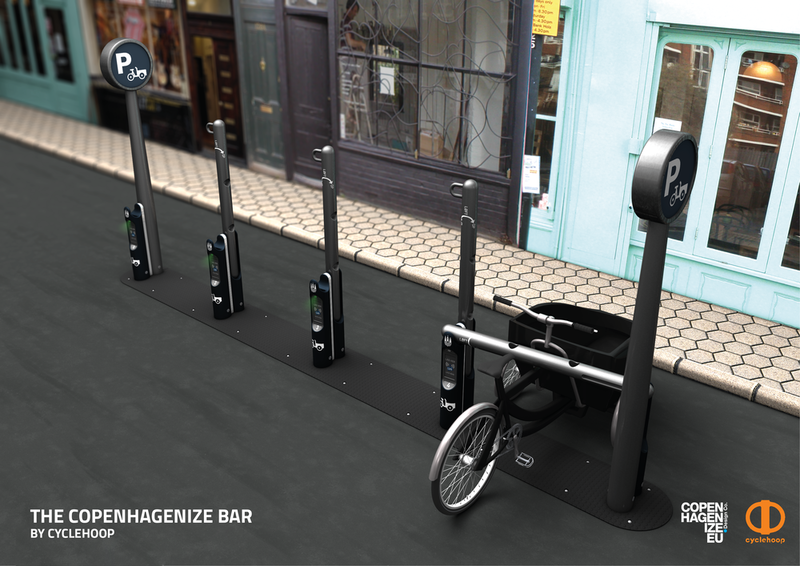 Copenhagenize Design Co. developed a design for on-street parking for cargo bikes and promptly teamed up with Cyclehoop in London to develop it. The Copenhagenize Bar is the result. It is currently in testing phase. In 2010, Copenhagenize Design Co. developed two prototypes to test in the urban theatre in Copenhagen. Bicycle users invariably lean up against lightposts and other urban inventory when waiting at a red light, in order to avoid hopping off the seat. Basic bicycle user behaviour. We thought it would be a good idea to make it more convenient for them by attaching handles to the lightposts. It was a great success. We also hung up garbage bins with nets on strategic locations around the city - along stretches with cycle tracks. The film we produced about these two prototypes tells the tale.